Looking at the name of this wine, for some reason I can’t get the image of a deck of cards out of my head. This wine has a really smokey, green, and mineral nose with notes of cloves, tobacco, bell pepper, earth, and something stony/mineral that I can’t quite place — slate, if slate has a smell? Flint? Concrete? Can’t really put my finger on it, but it’s the smell of a freshly built stone cellar. In the mouth there is a rush of rich, luscious raspberry, blueberry, and boysenberry upfront, toning down in the midpalate before finishing with those same red- and blue-berry notes along with hints of clove and spice. Ample acidity and tannins, along with hot alcohol, all make an appearance simultaneously at the tail end of the finish. Enjoyable on its own, much better with food. I recommend it with a pot roast, stew, and gamey fowl such as turkey. Other wine blog reviews for Koyle Royale Carmenere can be found at The Reverse Wine Snob, Drinkhacker, Dallas Wine Chick, Chilean-Wine, The Good Wine Guru, and The Yum List. Going on 15 years now, Chile has been my “go to” for unearthing great wine values. A long time ago I discovered Casa Lapostolle’s “Cuvee Alexandre” line of wines, finding the Merlot particularly enjoyable — and fairly easy on the wallet. That said, when I happened upon this “Casa” Cabernet Sauvignon, my expectations were high — and I wasn’t disappointed. If you went through Spanish 101 — or at least knew someone who had — then you know “casa” means “house.” My guess, then, is that the “Casa” line from Lapostolle refers to what they believe are “house wines.” If so, the moniker fits. For me, this supple, earthy, yet easy drinking Cab is a wine that I’d be very comfortable serving as my “house wine” (if such a thing existed under my roof). 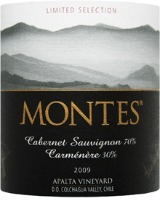 On the nose you get typical Cabernet aromas: black berry, earth, some leather and tobacco. In the mouth the berry fruit is plump but just shy of “jammy,” and is well-balanced by ample acidity and mild tannins. There is a hint of vanilla sweetness that Americans love, which makes it appealing on its own, yet thankfully doesn’t get in the way of food matching. I successfully paired it with simply broiled filet mignon, and to me, the meat brought out the juicy fruit of the wine — I enjoyed it much more next to my plate than I did after my last bite. Disclosure: At the end of a wine tasting that shall remain nameless to protect the innocent, this was three-quarters of a leftover bottle gifted to me by a generous brand rep. No wines shall go to waste!